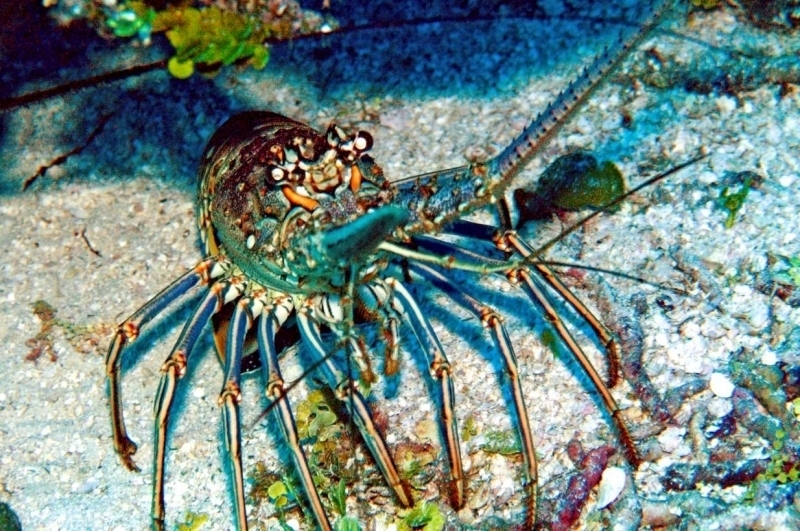 Spiny Lobsters get their name from the forward-pointing spines that cover their bodies to help protect them from predators. 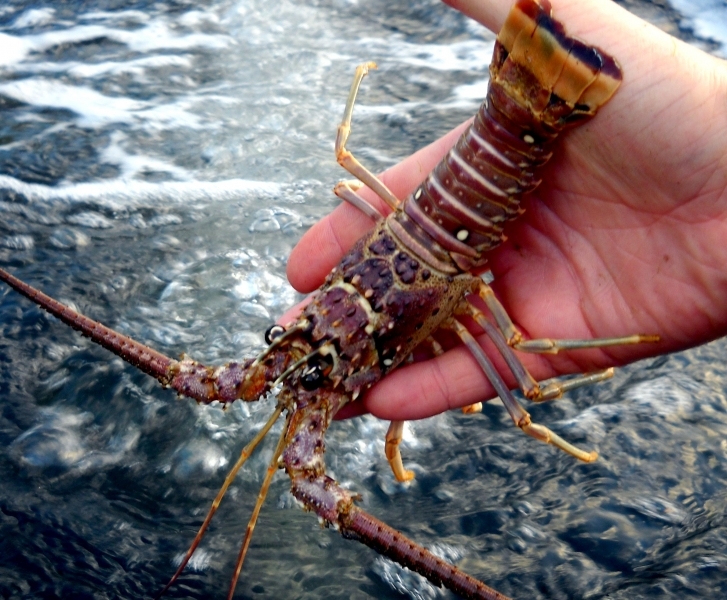 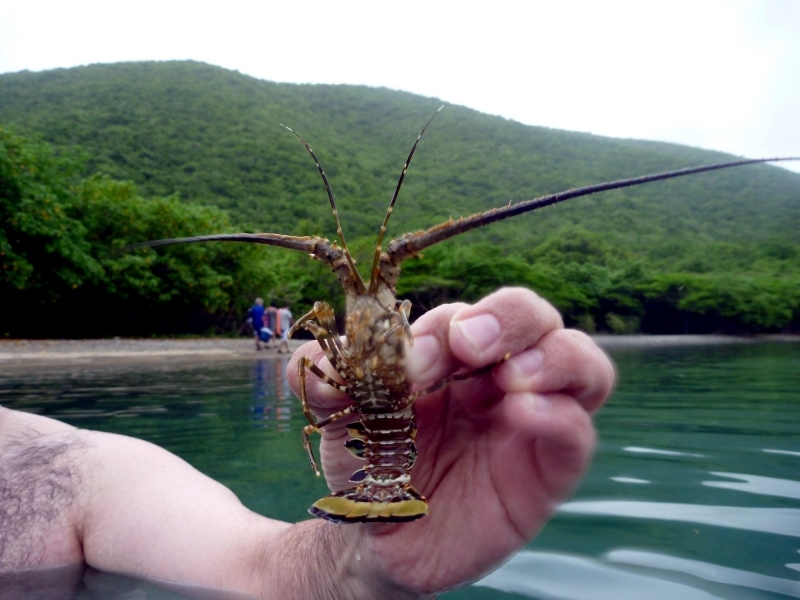 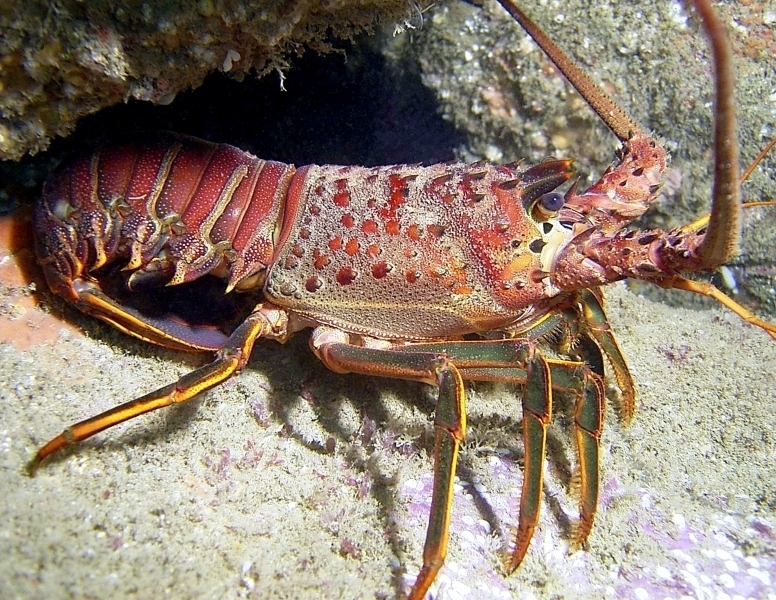 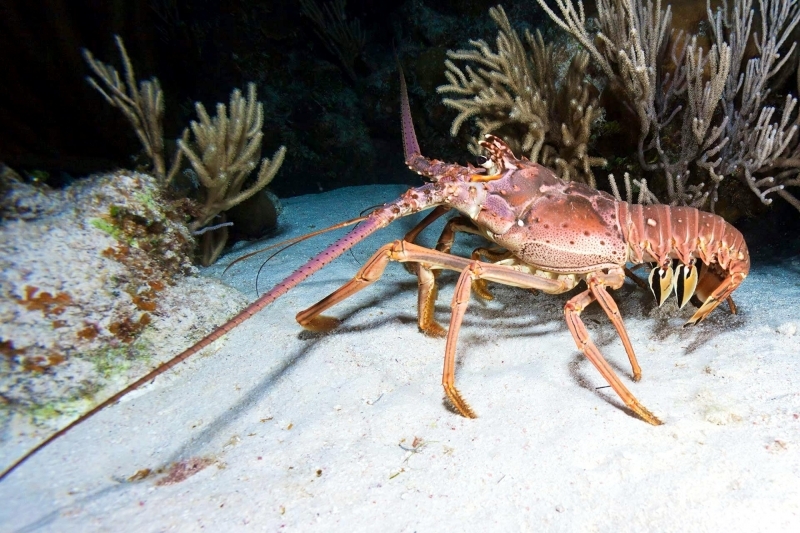 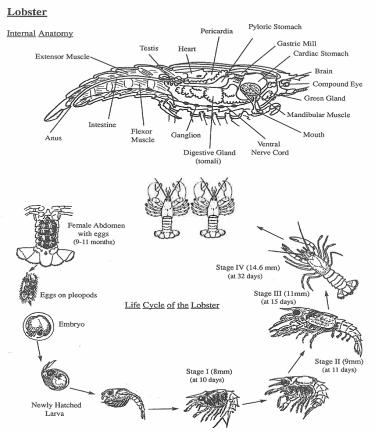 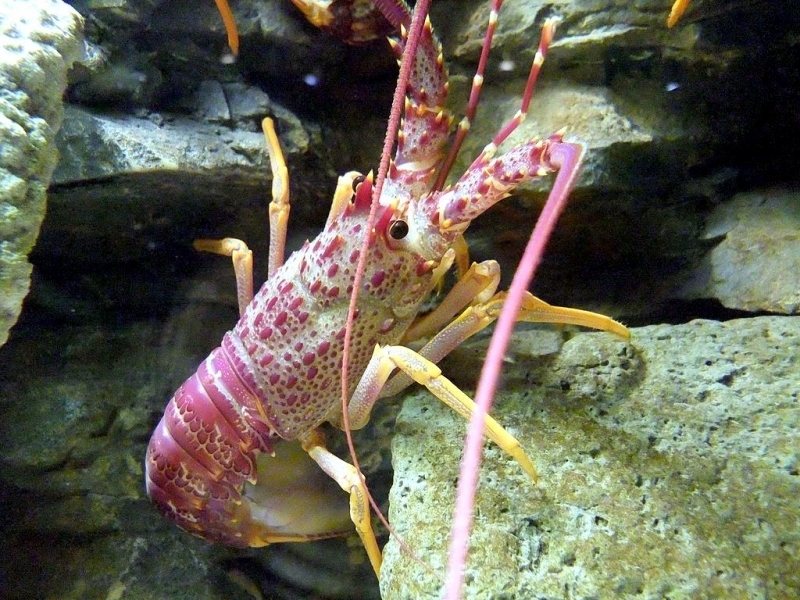 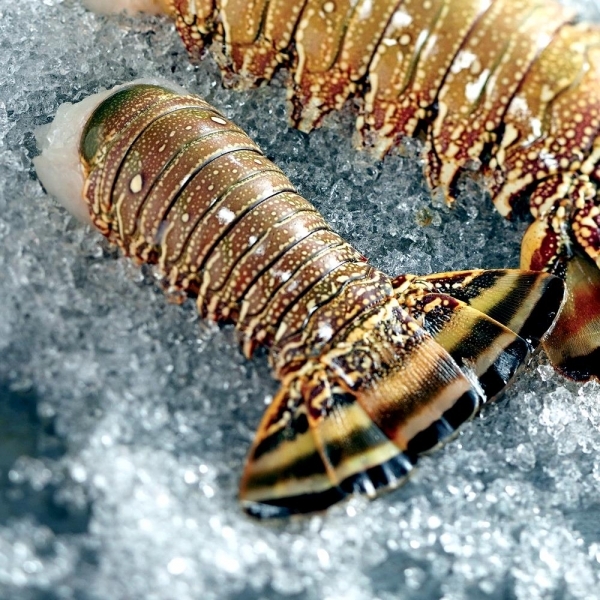 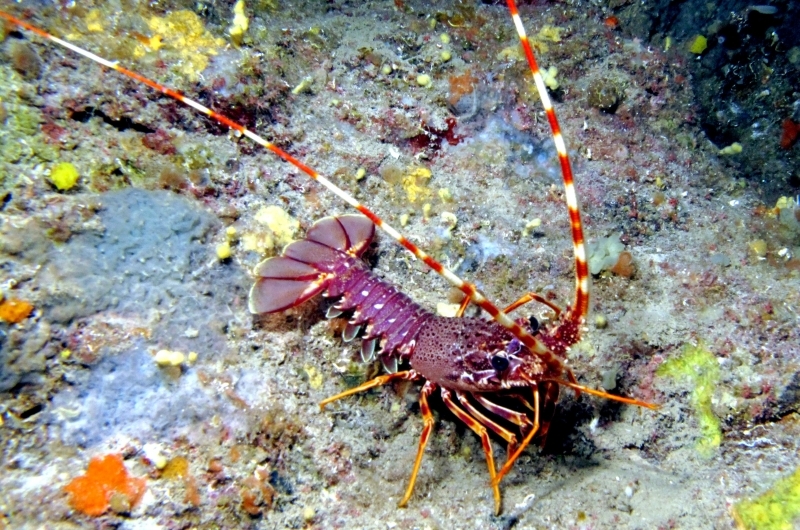 They vary in color from almost white to dark red-orange and 2 large, cream-colored spots on the top of the second segment of the tail, make Spiny Lobsters easy to identify. 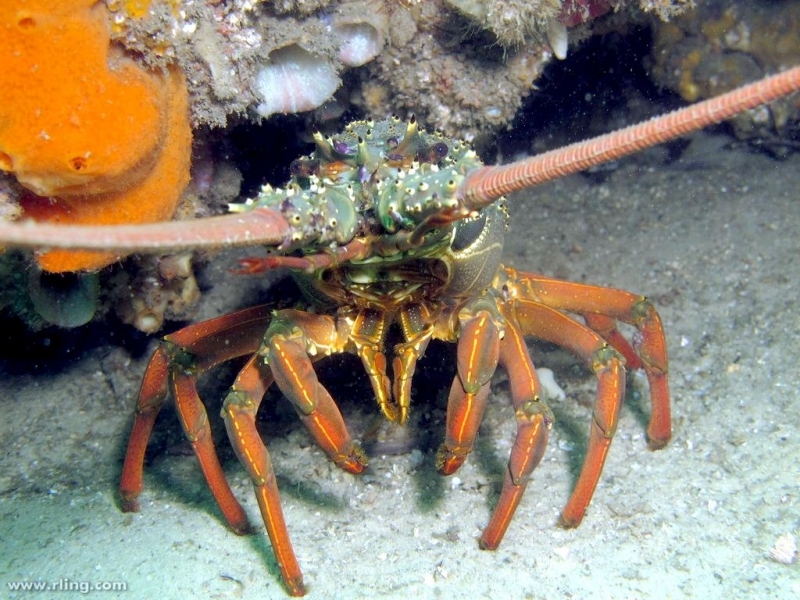 They have long antennae over their eyes that they wave to scare off predators and smaller antennae-like structures called antennules that sense movement and detect chemicals in the water. 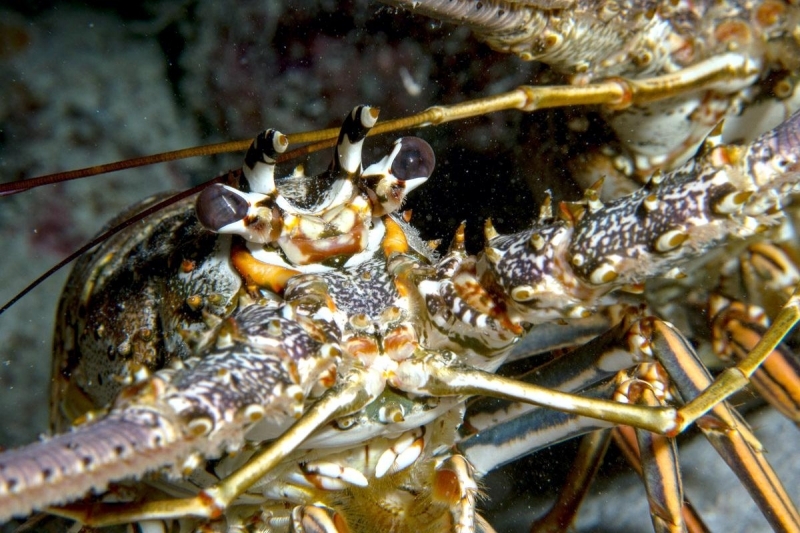 Before the 20th century, eating Lobster was a mark of poverty because to many people they resemble an insect and is also why their Latin name is “locusta” meaning “locust”, which led to the name “Lobster”. 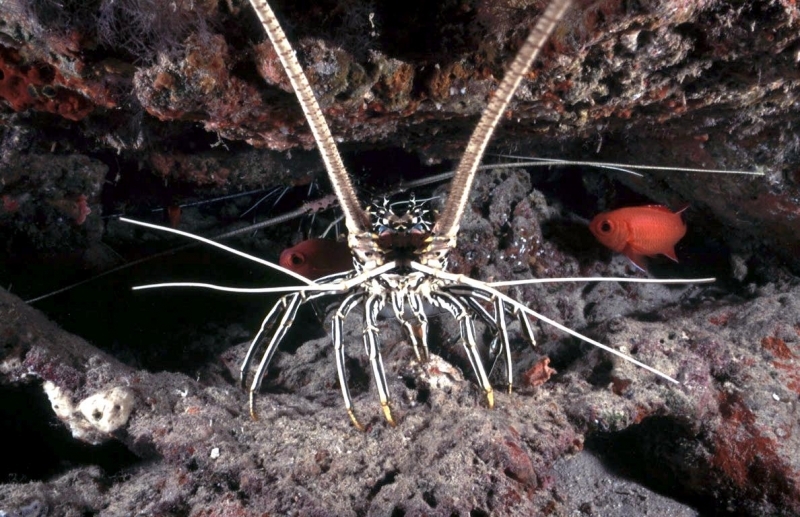 Adult Spiny Lobsters make their homes in the protected crevices & caverns of coral reefs, sponge flats and other hard-bottomed areas. 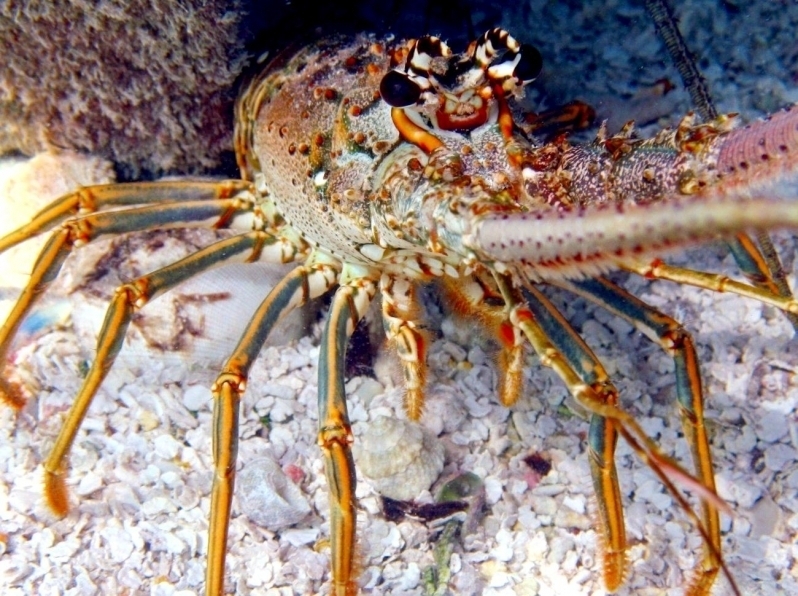 The Spiny Lobsters spawn from March through August and females carry the bright orange eggs on their undersides until they turn brown and hatch. 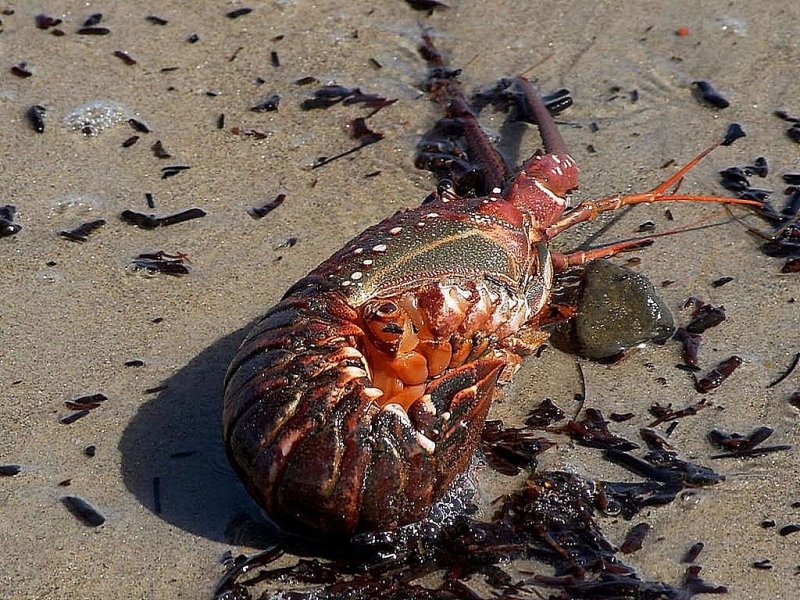 Larvae can be carried for thousands of miles by currents until they settle in shallow near-shore areas among sea grass & algae beds and feed on small snails & crabs. 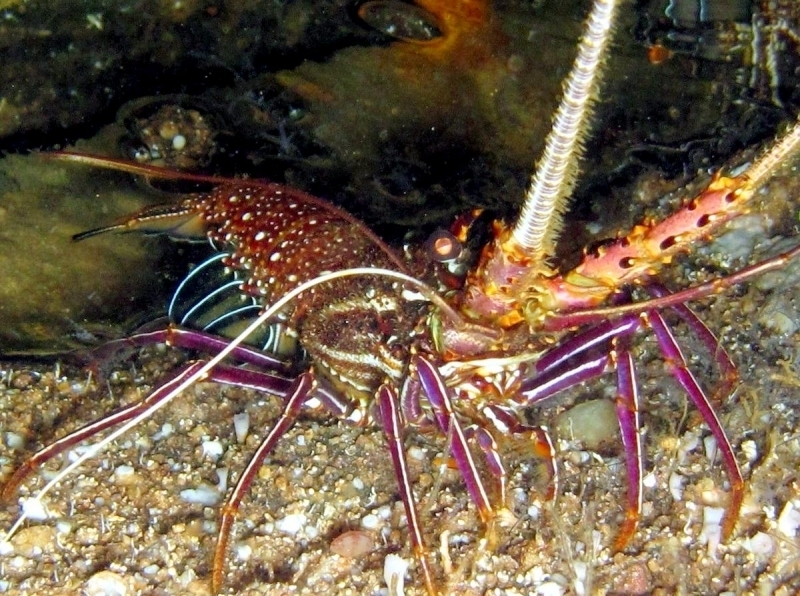 Spiny Lobsters are solitary until they reach the juvenile stage, when they begin to congregate around protective habitat in near-shore areas. 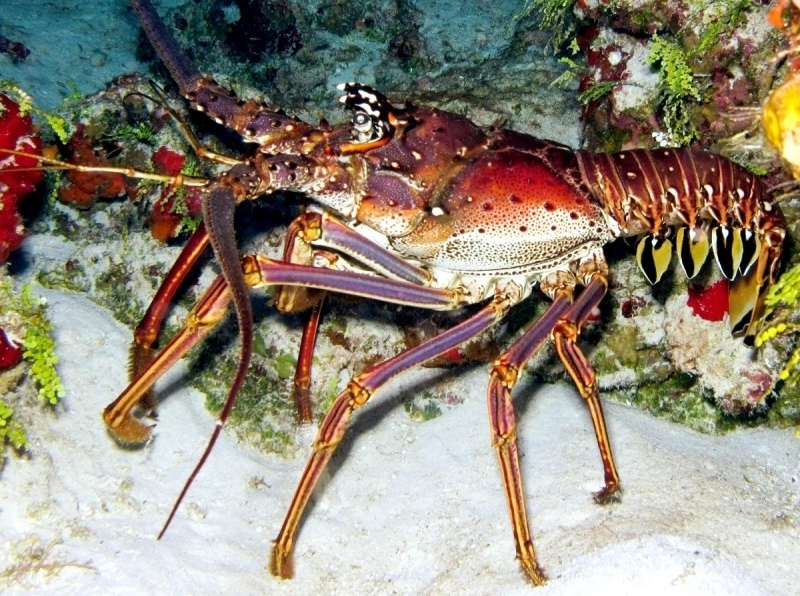 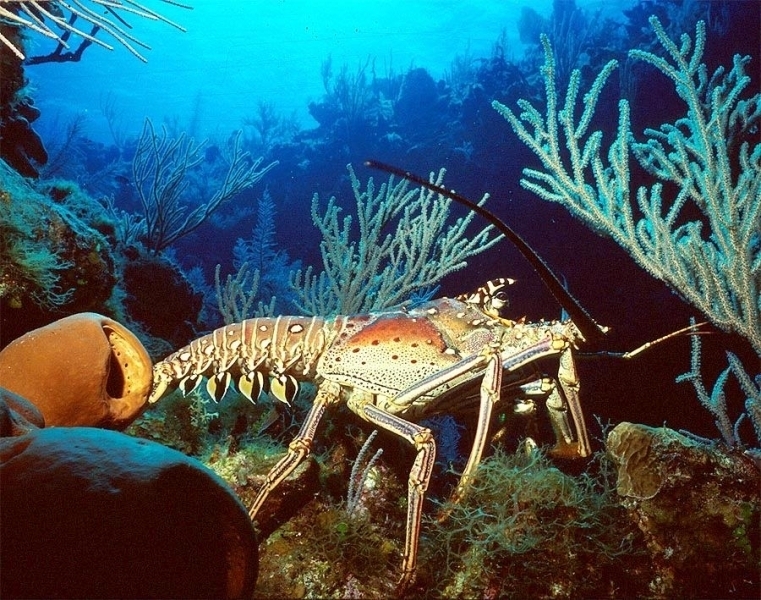 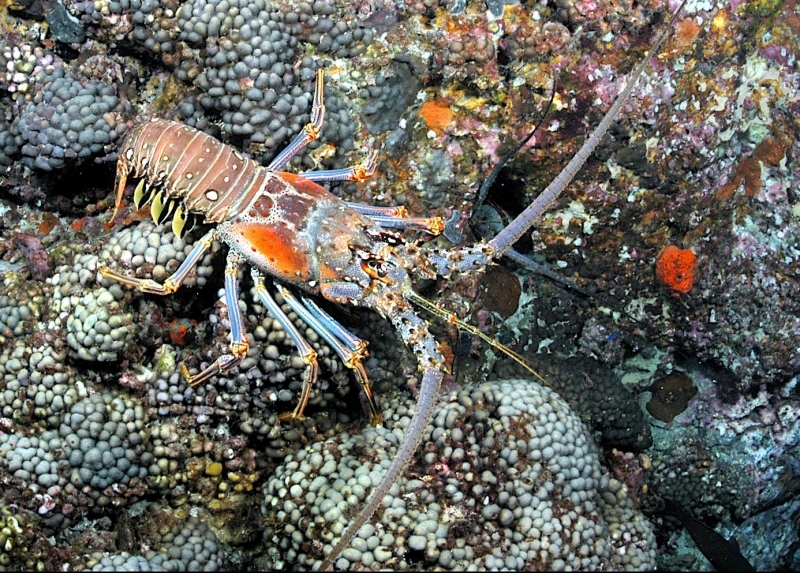 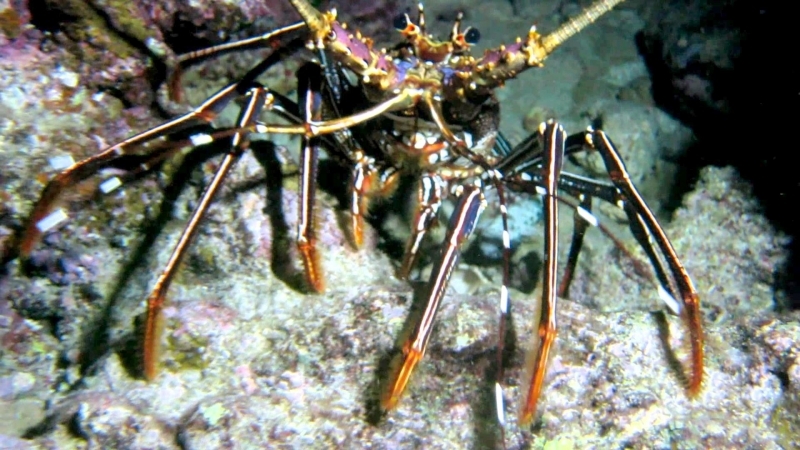 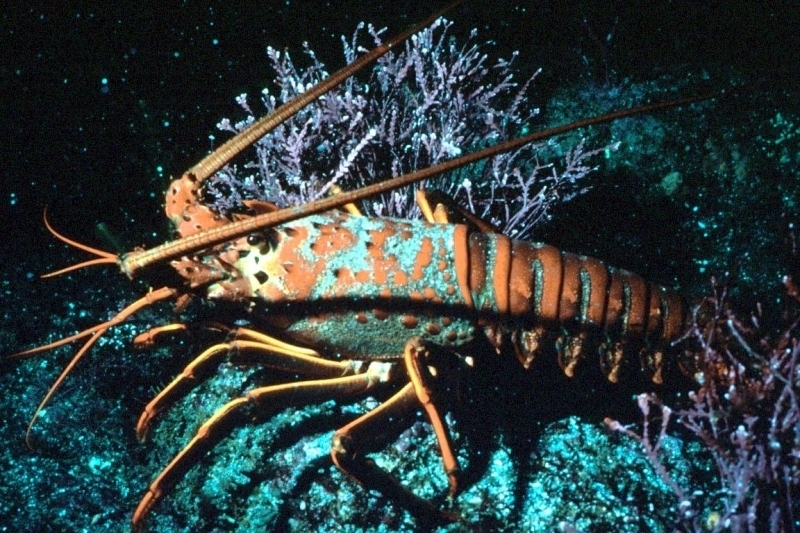 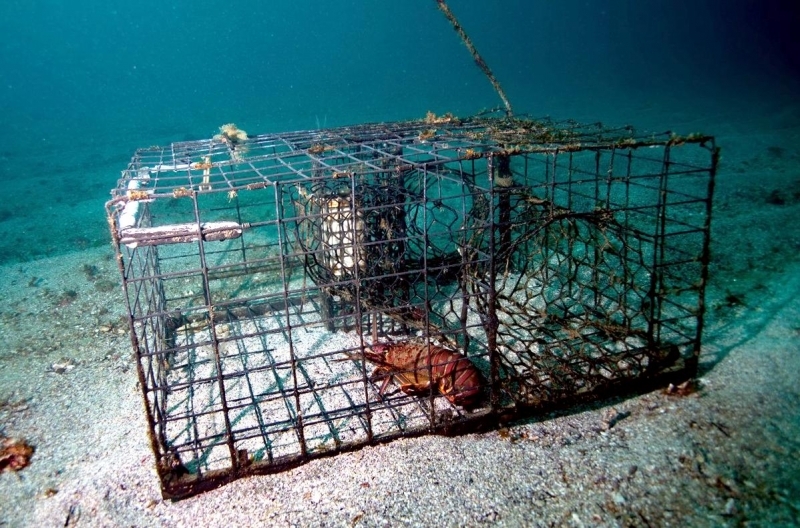 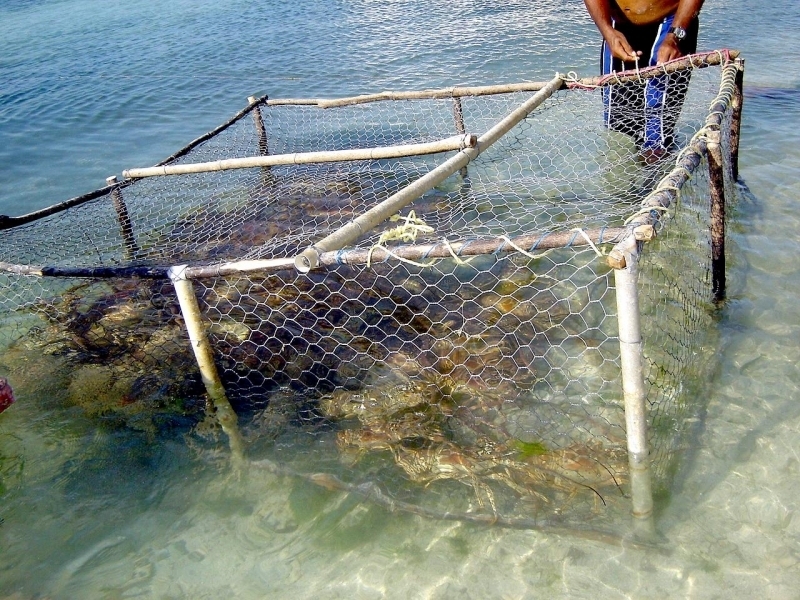 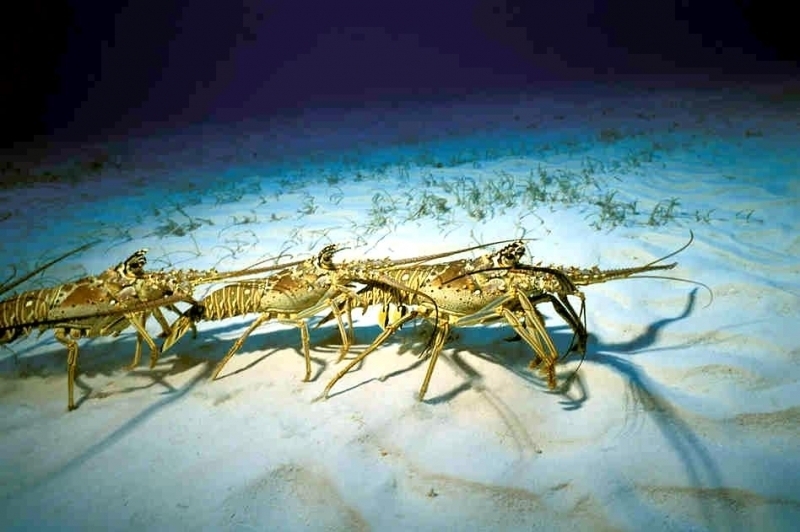 As they begin to mature, Spiny Lobsters migrate from the nursery areas to offshore reefs. 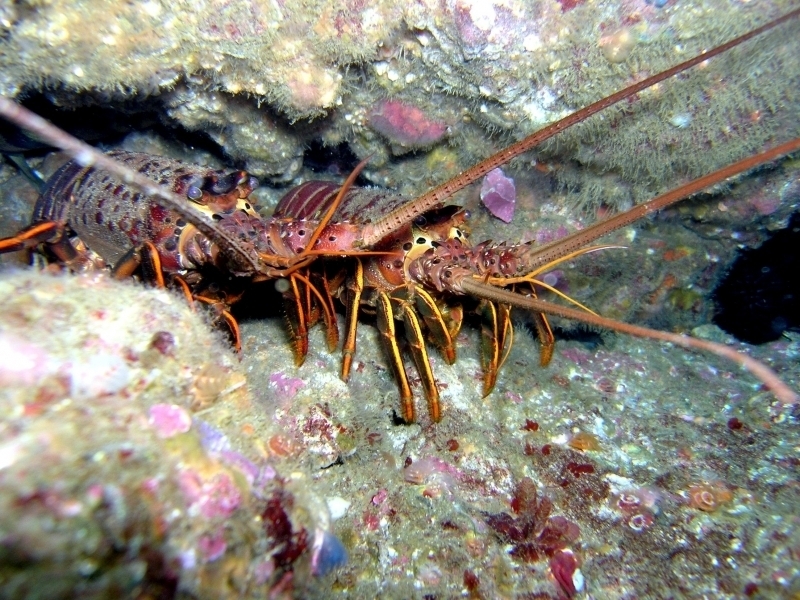 They stay in their dens during daylight hours to avoid predators, emerging a couple of hours after dark to forage for food. 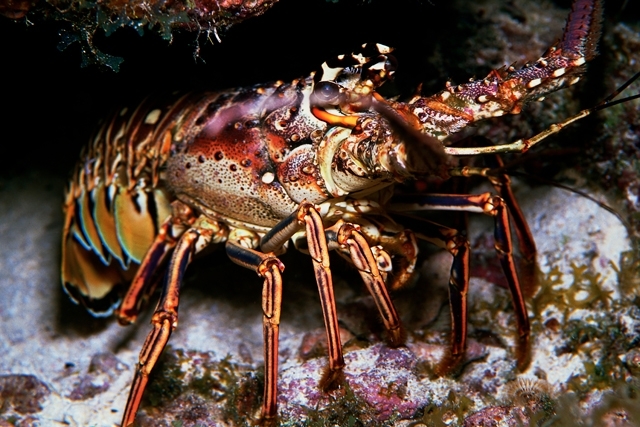 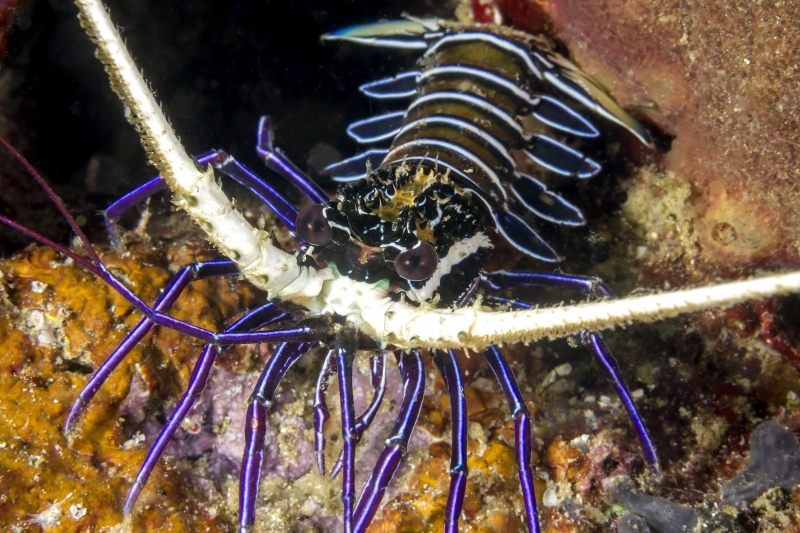 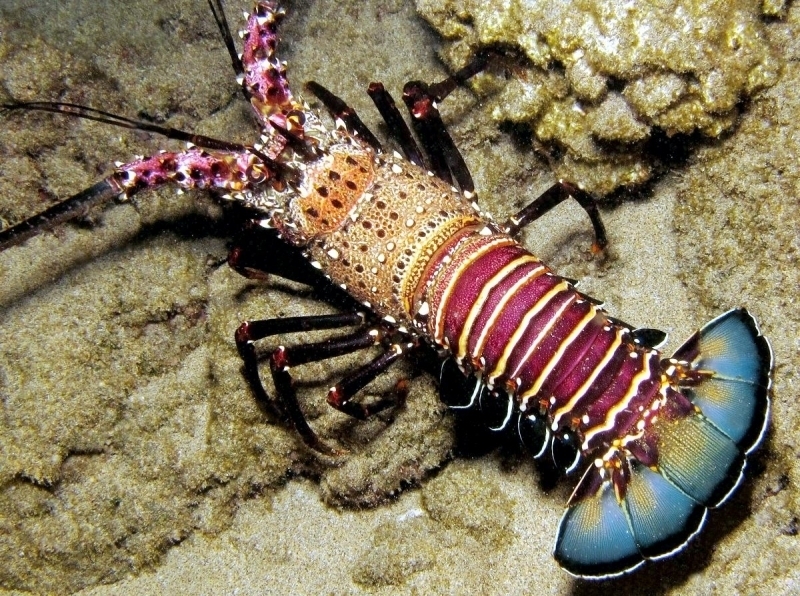 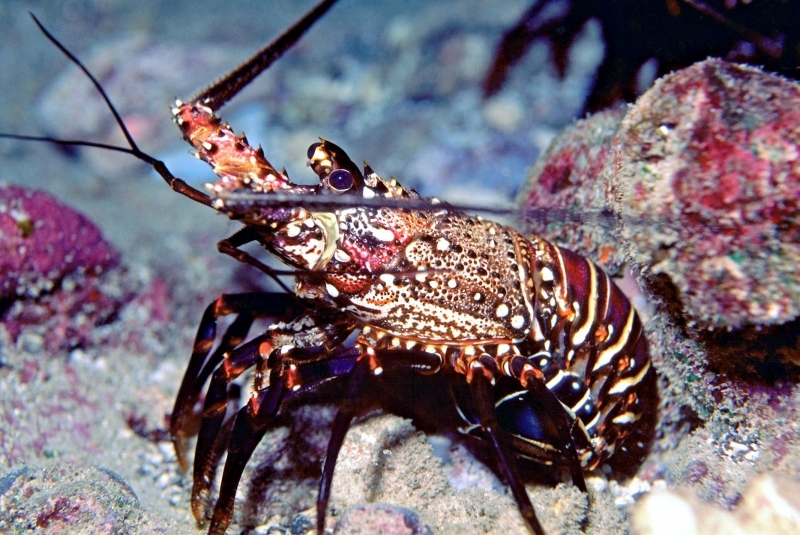 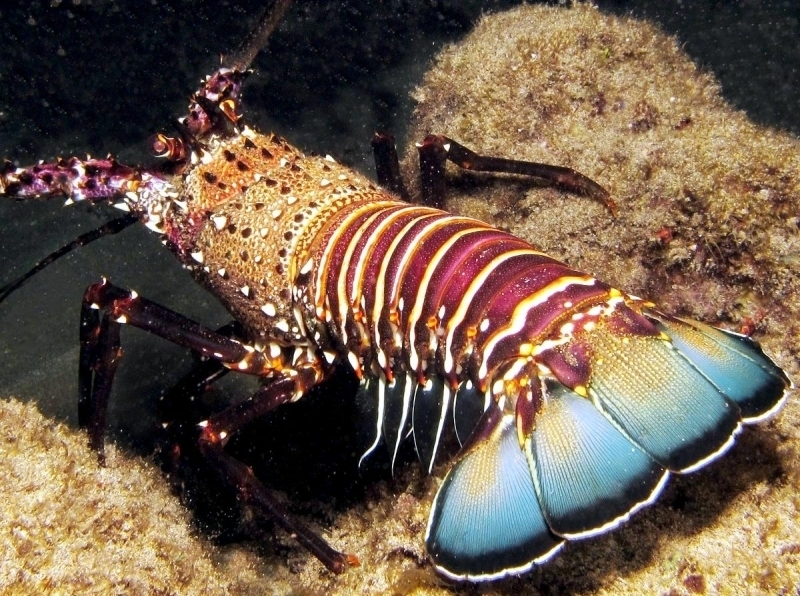 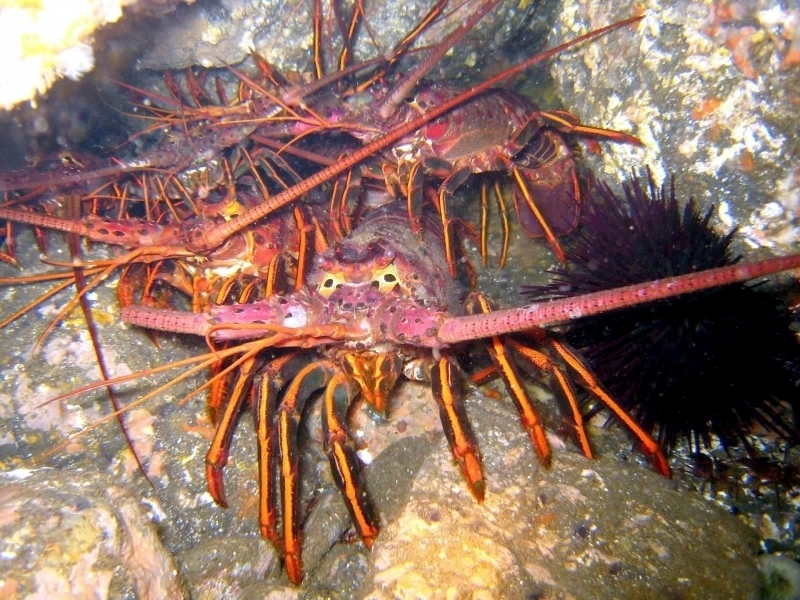 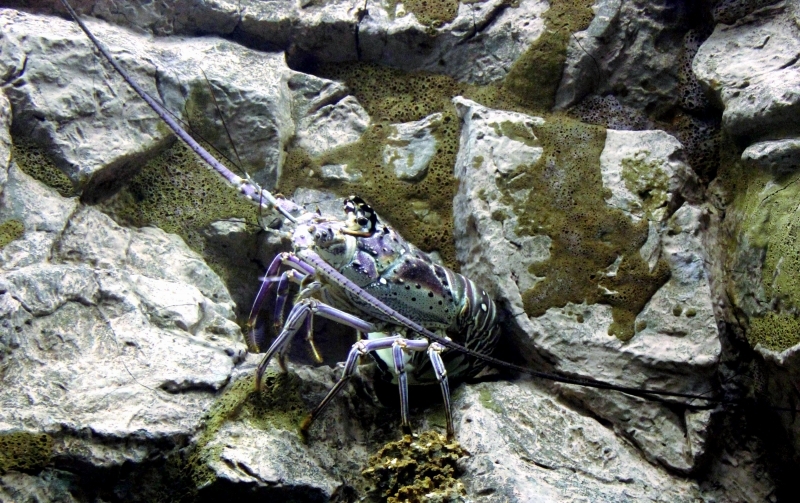 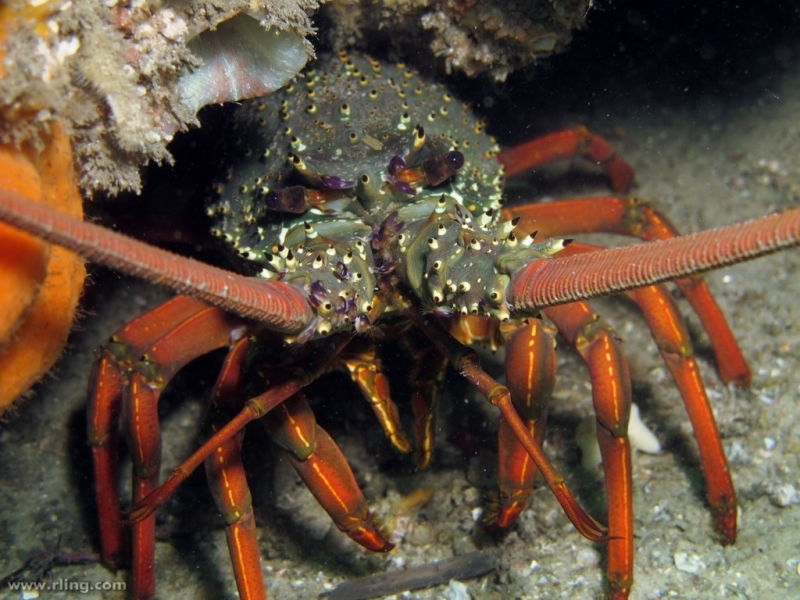 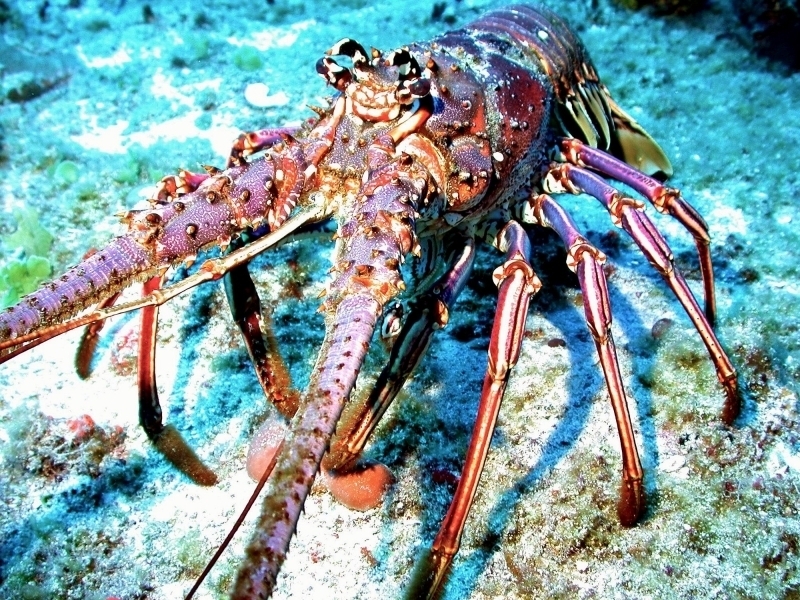 While Spiny Lobsters will eat almost anything, their favorite diet consists mostly of snails, clams, crabs & sea urchins. 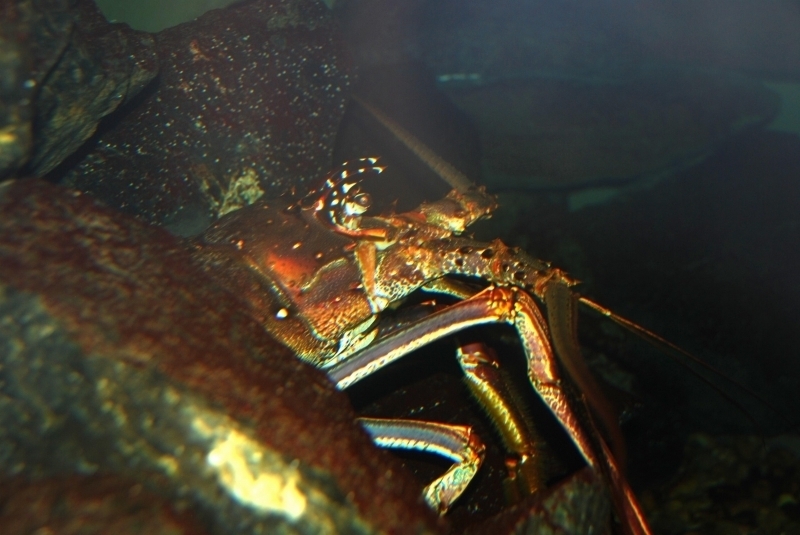 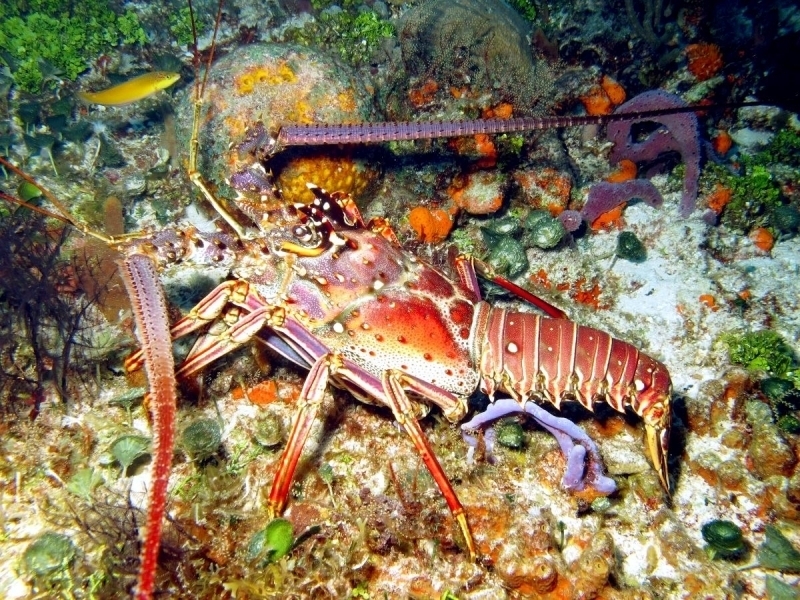 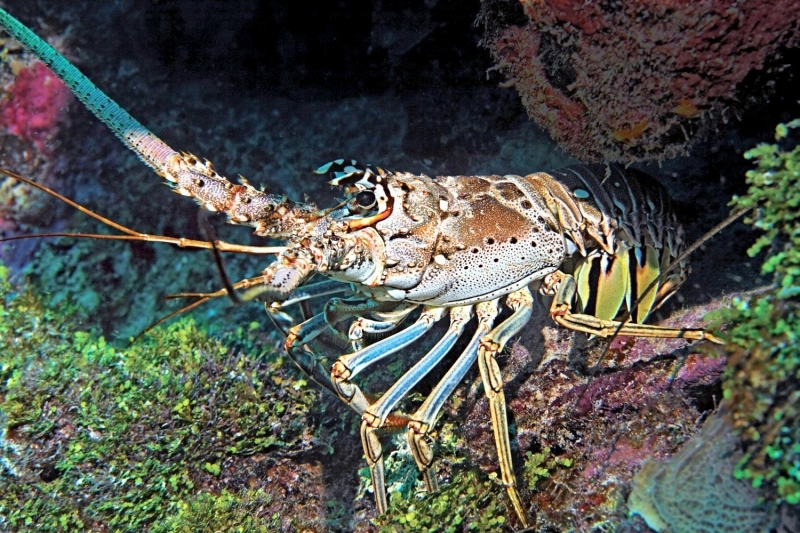 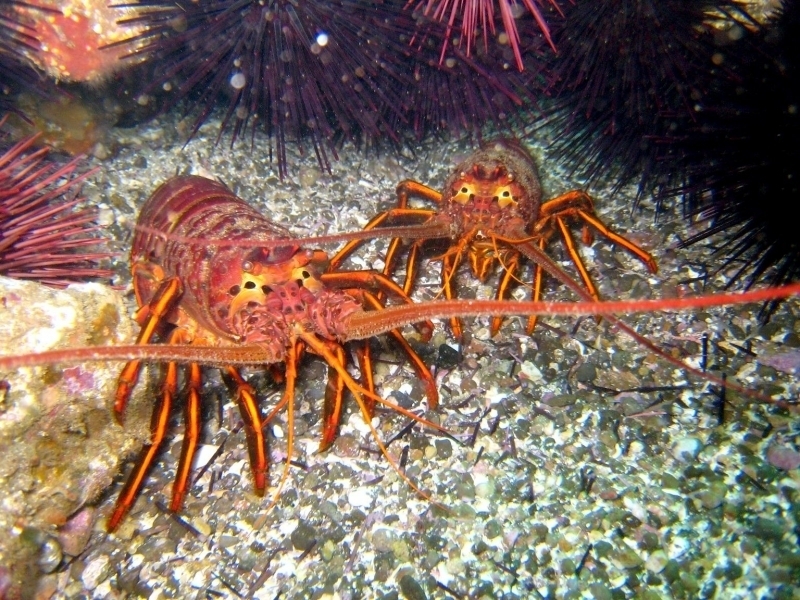 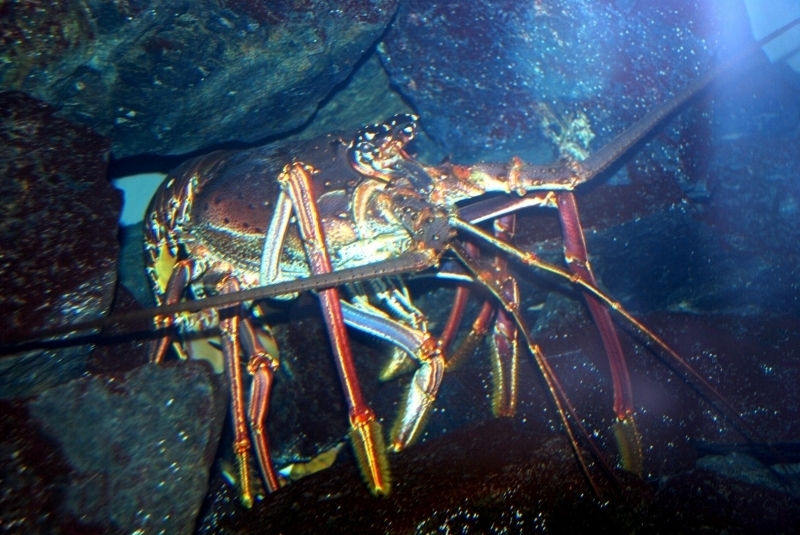 The Spiny Lobsters return to the safety of their dens several hours before sunrise. 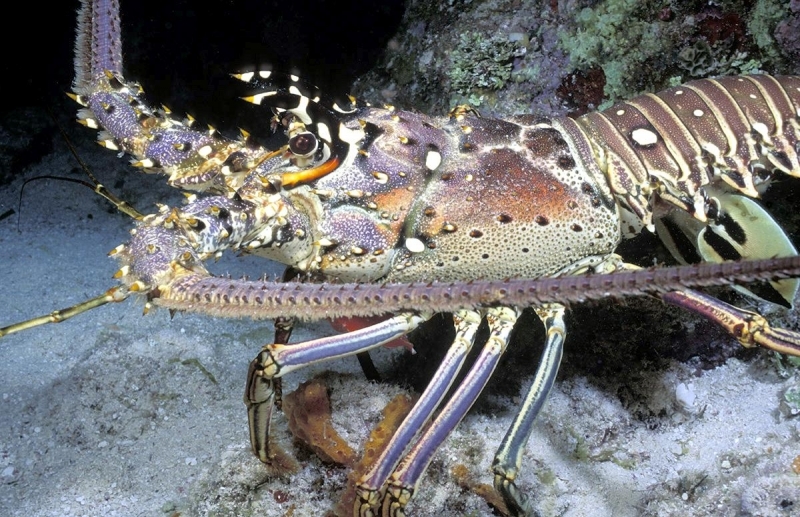 It takes a Spiny Lobster about 2 years to grow to the 3 inch carapace legal-harvesting size and they can grow as large as 15 pounds. 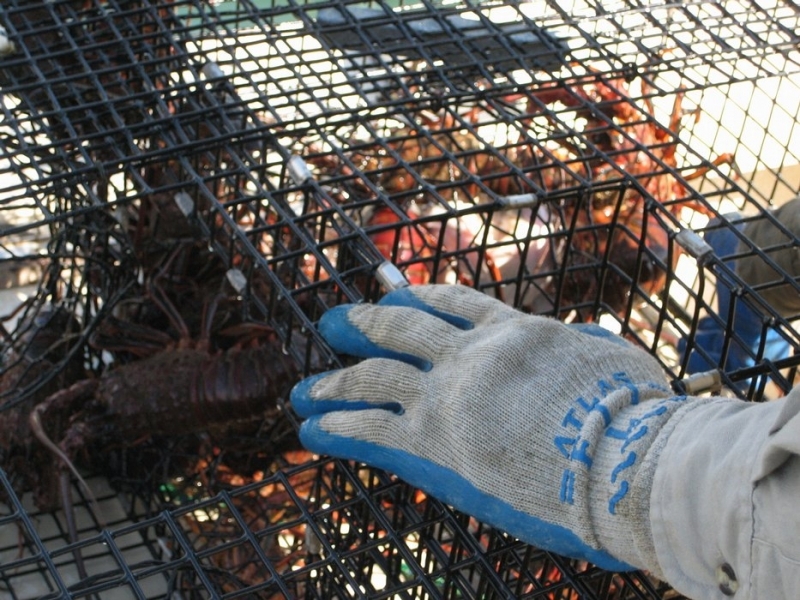 The commercial harvest averages 6 million pounds per season with an average annual value of $20 million USD.